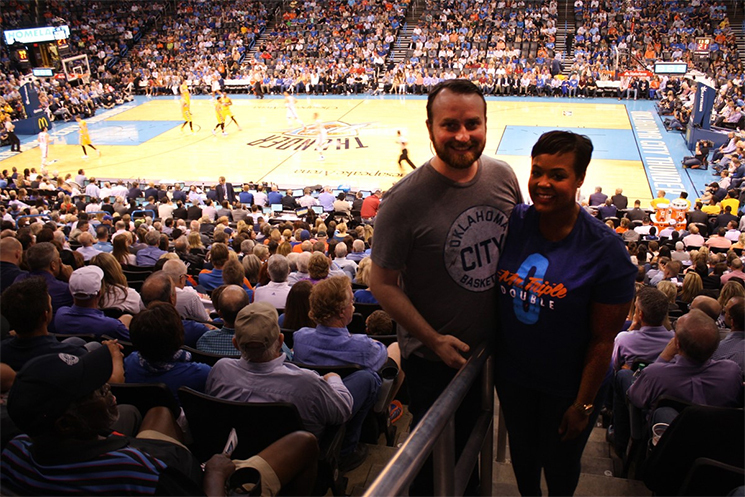 The 30-year-old insurance agent said she has been a Thunder fan “since the beginning,” and was very happy when she found out she won. “I couldn’t believe it, I was super excited and I really wanted to be there. I was telling myself I wanted to be there for the team’s last regular season home game so... I’m ecstatic,” Sourie said. Sourie won the prize through an online drawing, and will have one year of full access to any of Planet Fitness’ 1,350 locations, with seven of them located in the OKC area. All clubs are open 24 hours, seven days a week. They include a wide variety of equipment such as treadmills, ellipticals, arc trainers and stationary bikes, which are pointed at large flat-screen televisions for member entertainment while working out. The Edmond resident is already familiar with Planet Fitness, having been a member since February. “Working out at Planet Fitness has been a great experience. It’s super chill and low key, and you can go in there and do your thing, and just be in your own zone. There’s no pressure involved whatsoever. If I want to go in and only do cardio, no one judges me,” Sourie said. Planet Fitness also offers a popular 30-minute PF Express circuit room, dedicated abs and stretching room, a full complement of user-friendly strength equipment, the new PF-360 Circuit machine and locker rooms that include free day-use lockers, private changing rooms and tile showers. “I am happy this grand prize went to such a deserving fan, and also want to thank the Oklahoma City Thunder for their partnership with this contest. My team is looking forward to seeing Taylor at one of our seven OKC-area locations, and hope she enjoys all the amenities we packed into those gyms,” said Trey Owen, CEO of United PF Partners, a leading Planet Fitness franchise group that currently operates 67 locations across nine states. Planet Fitness’ mission is to provide a high-quality fitness experience in a welcoming, non-intimidating environment. With that in mind, each club features the brand’s iconic “Lunk Alarm”—a purple and yellow siren on the wall used as a light-hearted, gentle reminder that grunting, dropping weights or judging others is not permitted. For more information or to join online, visit www.PlanetFitness.com or follow the brand on Facebook (www.facebook.com/PlanetFitness) and Twitter (www.twitter.com/PlanetFitness).